Liv's love for everything Maple has only grown over the years. Rich and robust in flavor, pure maple syrup satisfies her sweet tooth while adding a depth and complexity beyond that of granulated white sugar. And with 1/4 cup providing generous doses of Manganese (necessary for brain and nerve function) and Riboflavin (produces energy and works as an antioxidant) in addition to a decent dose of immunity fighting zinc, this sweetener (lower in sugar than pure honey) is one I can feel good about giving her in moderation. To be sure you are purchasing pure maple syrup, always check the ingredients listed on your product where you should find one (1), and only one, ingredient - maple syrup. Many imitation syrups, or pancake syrups, do not contain any real maple syrup at all, and some of those claiming to be made from pure maple syrup may have as little as 5% of the real stuff. Maple syrup, actually the boiled sap of the sugar, black or red maple tree, is harvested by tapping, or piercing, the tree to allow the clear, almost tasteless and low in sugar sap run freely from the tree. After collection, the sap is boiled and the water evaporated leaving the various grades of pure maple syrup that we find in our local stores. In general, syrups tapped at the beginning of the harvesting season are clearer and lighter in flavor, such as Grade A. Grade B provides a darker, stronger and more complex syrup that remains a favorite with mixologists when crafting bourbon, rum and whiskey cocktails. Whichever grade your prefer, maple syrup adds a special, "homey" flavor to your baked goods and an additional depth and complexity to soups and savory dishes. 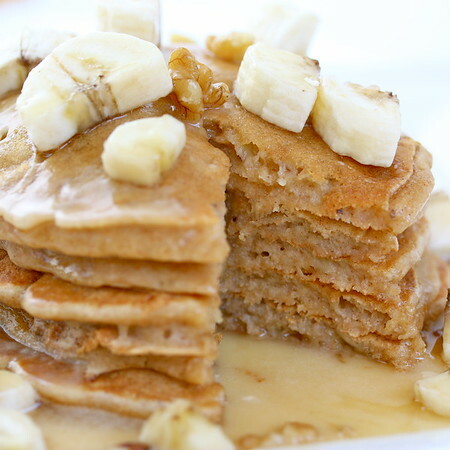 Wonderful in so many recipes, our favorite remains the simple pancake or waffle drenched in our favorite Grade B Pure Maple Syrup and topped with a sliced banana. 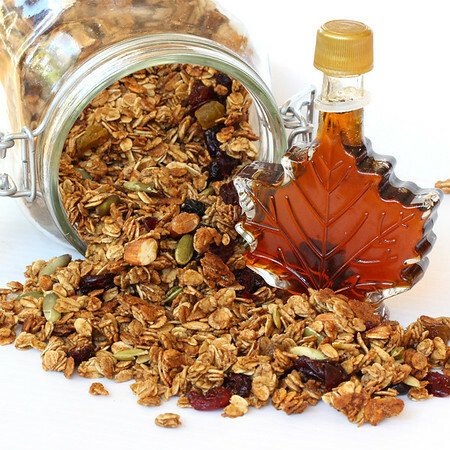 With thanks to Pure Canadian Maple Syrup, who so kindly sent us samples of Grades A and B Pure Maple Goodness, we present to you some of our favorite Maple recipes in addition to a tasty new creation made with the samples - Maple Granola. Pure Canadian Maple Syrup's web site is an excellent source for additional maple syrup health benefits and they feature a collection of recipes. Do you have a favorite use for Maple? Let us know! Preheat oven to 300º. Generously coat a large rimmed baking sheet with cooking spray. Stir 1/4 cup of the brown sugar and the syrup in a small saucepan over low heat until sugar dissolves, occasionally brushing down the sides with a wet pastry brush. Set aside to cool. In a small bowl, whisk together the egg whites, vanilla and spices. Add to the cooled syrup mixture. In a large bowl combine the oats, flax meal, additional 1/4 cup of sugar, and nuts. Add the syrup mixture and toss well to coat the ingredients evenly. Spread the mixture evenly onto the prepared baking sheet. Bake about 15 minutes, then stir. Bake another 10 minutes, stir again. Bake until a rich golden brown in color, watching closely towards the end to avoid burning. Remove from oven and pour into a large bowl, stir in dried fruits and pepitas. Cool, then place into airtight containers. ** The original recipe from Epicurious calls for 3/4 cup of brown sugar, this was just too sweet for us, but if you want sweeter up the sugar. *** Edited to note that one might want to go lighter on the cinnamon - Bex below commented that the cinnamon overpowered the maple flavor, and I believe she is right. We love cinnamon, however, go lighter if you prefer a more pronounced maple flavor. Thanks Bex!! 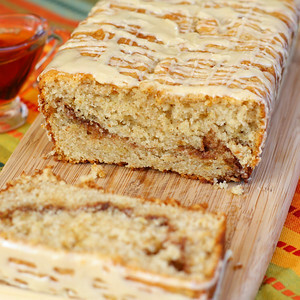 A favorite of my teenage son, this coffee cake is sweetened with the wholesome goodness of pure maple syrup. Tenderized with sour cream, and filled with a brown sugar/cinnamon swirl, this cake will not be long on the plate. Sweetened with pure maple syrup, this "pancake", reminiscent of the ever-popular Apple Pie was gone in a flash. Light on the flour, the pancake takes on an almost custard-like texture and is positively irresistible. One of our all time favorite pancake recipes, these fluffy flapjacks are topped with pure maple syrup mixed with a hefty dose of powdered sugar along with a touch of vanilla and butter to create something "other-worldly". A beautiful Sunday morning treat! I have found some maple flavored agave that I have been using instead of maple syrup for most recipes. It is a bit cheaper than pure maple syrup. This granola sounds wonderful! Love the idea of using egg whites to keep the fat content low. I love everything maple, too. I'm from Canada, after all! This granola looks very tasty and wholesome… and wow, I would love some of those pancakes right about now. 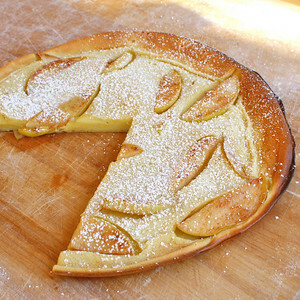 I am definitely going to bake that! This sounds good. I would like to be eating some of the granola. We lived in New York for a year and as a part of a school project my class tapped some maples, collected the sap, boiled it down and then had a pancake breakfast with our own home made syrup. It was pretty awesome. My most favorite to have the stuff is that stack right there in the bottom picture. It's downright swoonable. I love your other maple creations. I think the puffed apple pancake will be made in my kitchen soon! Wow - the granola is absolutely stunning! I have pure maple syrup in my fridge, but honey bunny guards it like it's in Fort Knox! He wants it on HIS pancakes only...he cracks me up! The bottle was a gift and he treasures it! Real maple syrup makes all the difference in the world as far as flavor. I grew up on a farm in New England never eating anything but real maple syrup. It wasn't until years later I even knew they made imitation, and when I tasted it I just couldn't figure out why anyone would ever eat it! My favorite use is in a vinaigrette, lends such a light sweetness without overpowering the salad. Lots of info on maple syrup here-good to know. Also you have some tasty links here, especially the first one. Now I need to get on the ball and make something with that wonderful syrup-yum! I love maple syrup! I grew up in Vermont and we use the tasty stuff on everything. I often put it in granola, cookies, cakes, breads, sauces, you name it. One of my favorite maple recipes is pan seared pork with maple ginger sauce. The sweet maple and spicy fresh ginger is an amazing combination! This granola looks fab-u-lous!! Having grown up in Vermont, I like maple ANYTHING! One of my absolute favorites is Maple-Mashed Sweet Potatoes ... If you click on my name in this comment, it will take you to that recipe. The granola is excellent! Ellie gobbled it right up. I am going to make some for sure. The pancakes look like a favorite too. Thanks for sharing. This granola sounds wonderful! I would love a big serving of it right now :)! 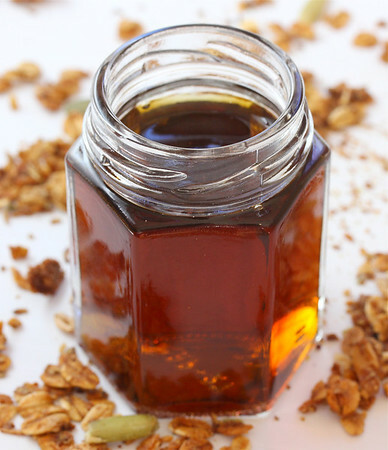 Granola made with maple syrup always tastes the best in my opinion. I need to make some soon! Your granola sounds amazing!! And I looove those pancakes! They look delicious!! Yum, Kim! I've got some maple syrup left from the maple-worcestershire onions I made for a burger featured on my blog a couple of weeks ago. Now I think I know what to do with it for something special. 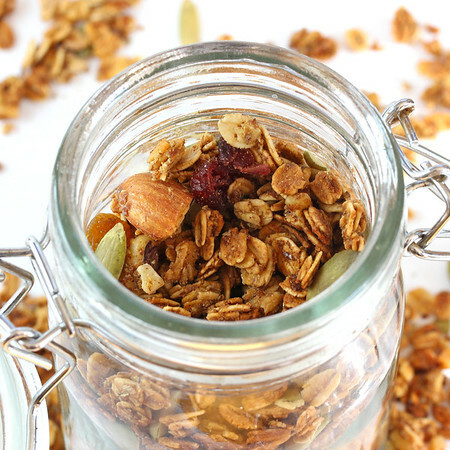 We love granola with yogurt for an easy breakfast or quick snack! Mmmm, gorgeous. I love maple syrup so much! Just made this tonight - big hit with me and my husband! Yogurt and granola is my favorite dessert and snack. Thank you for posting this! Thank you so much for this recipe! Love maple recipes and now I've got FOUR! Thanks for sharing, Kim! Luckily pure maple syrup is widely available but there is still a lot of fake maple syrup on the market alas. It is good that you underline well how to identify pure maple syrup, because obviously corrupted USDA does not do its job well. Because maple syrup has such a nice, subtle taste to me, I don't like it mixed with too many things/ingredients. So my favorite use of it is simply on top of a French raw milk yogurt cold "faisselle". Mmm my dad used to make his own maple syrup from the trees in our backyard growing up. Boiled down the sap seemed like it took forever! Maple syrup is addictive - your maple cake looks incredible. I have to try this for my family. mmmmm maple syrup! There is this big Fair that the Northeast has every year and they sell this maple syrup candy that is to die for. MMM I am a fan of anything maple and Love making my own granola. This recipe looks great! Oh, this is a fabulous...less guilt provoking...granola. The addition of maple syrup is a wonderful and delicious idea! Making this right now! So far, it's delicious. I used maple syrup from my aunt. She taps a couple of acres, and we always go up and help. If anyone out in the blogesphere has a chance, go help make some syrup. It tastes like butterright out of the boiler. Yum! I DO wish I would have gone with a lighter spoon on the cinnamon - I think it overpowers the syrup's amazing flavor. Bex, thank you for letting me know what you thought about the cinnamon! I've had comments both ways, love the strong cinnamon flavor and a little too much. I should have thought earlier to note that in the post.. I've done that now! Thank you! Football Food - Super Bowl Food is here!